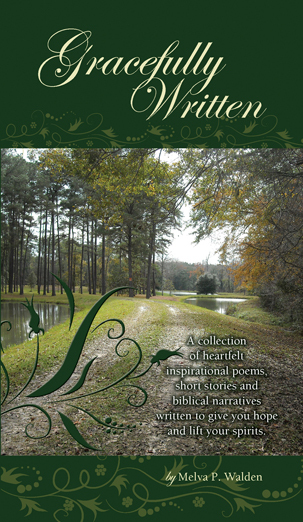 Gracefully Written is a collection of heartfelt short stories, inspirational poems, and biblical narratives written to give you hope and lift your spirits. Author Melva Walden has led an interesting life. Every time we meet for coffee, she tells me about cool friends she has made over the years. People like NBA players Clark Kellogg and Dikembe Mutombo, Olympian Teresa Edwards and Reverend Andrew Young, former United States Ambassador and former Mayor of Atlanta. She was recently invited to speak at two conferences honoring Dr. Martin Luther King, Jr. I love working with fascinating people like Melva! Here is what Melva had to say about working with me on her book. “I had the pleasure to meet Vanessa at a business seminar where she spoke to the audience about her business. Shortly, after meeting her I knew that I wanted to hire her to do the design, layout and graphics for my book titled, Gracefully Written. Vanessa was always available whenever I needed to ask her a question. She would calmly listen and then give her opinion. Vanessa is an excellent motivator and facilitator. She is reliable, very professional and she cares about the work her customers entrust her to do. Vanessa is a joy to work with. She went far and beyond my expectations and treated my manuscripts with great care and passion. Her enthusiasm for helping up and coming writers and artist, like me, is evident. The compliments I have received regarding the cover, layout and designs for Gracefully Written are astounding and are fitting for every poem or story. All you have to do is visit my website at www.GracefullyWritten.com to see for yourself. You can find out more about Melva and purchase your own copy of Gracefully Written at www.GracefullyWritten.com.